Lost Levels :: View topic - Sonic: The Lost Levels Lost Levels - A website about unreleased video games. 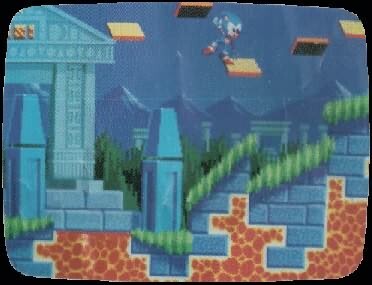 Do any of you recall back when Sega first started putting an in game picture of Sonic on the back of the Genesis box? ...there were these little chips (rotating I assume) falling from the sky, yet this was NOT part of the game when it finally came out. What's the deal? Was that only in the beta version, or what, was it leaked, ect. I'd always assumed this was concept art. I think BMF might have more insight than me, though. But there isn't really any more info to be had about it. Those probably aren't falling chips from the sky. Considering Sonic's position, they look more like platforms that were later taken out. Most likely they made the level too hard for the average gamer. Whether this was proven through focus group or just speculation by Sega I don't know but that's probably what happened. I stand by what I said: that's concept art. Those platforms may have never appeared in the game itself. I tend to agree with you, Red. Something about that lava doesn't look "right" by Genesis standards. Assuming for a moment that the platforms in that image were once real code and not just a mockup, I theorize that they'd have been removed because they were disruptive to the gameplay. Sonic games are all about high speed, and those platforms don't look like they'd lend themselves well to that. They look rather boring and useless, really. there have been a few more mock ups... like a desert level (Known in the sonic community as "Dust Hill Zone") and such..
SEEN IT. But yeah, definitely worth mentioning. I've been following this stuff for what seems like years. I think it's safe to say that most of the screenshots released by Sega themselves are mockups--they want the game to look its best, so they manually paste Sonic, the enemies, Rings, etc. into the scene. The shots have been dissected numerous times, and most people in the Sonic secrets scene nowadays would probably agree that Sonic's pose and positioning in each of the shots is totally unrealistic, considering how both the camera system and the game physics work. This doesn't mean that the elements in the screenshots never existed in the game, since some graphics and enemies have been found buried in the Sonic 2 prototype, but the scene layouts themselves are most likely pure fiction. Please note that this was just an assumption made by some Sonic fans after seeing that there was a "Dust Hill Zone" in the early level select screen... Even if it led to a completely different stage when selected.